Tenikwa is easily accessible by car if you have arrived in the Western Cape Province of South Africa. 20 minutes from Plettenberg Bay is the nearest town to Tenikwa. Drive approximately 20 km from Plettenberg Bay towards Port Elizabeth on the N2 National Highway. Continue on this district road (Forest Hall Rd) and keep left when the road forks. ( If you go down Animal Alley, you’ve gone the wrong way. Turn around and at the T-junction, turn right.). There is a Tenikwa Signpost with a white arrow showing you to keep left. You will pass a little Stone Church on your right. 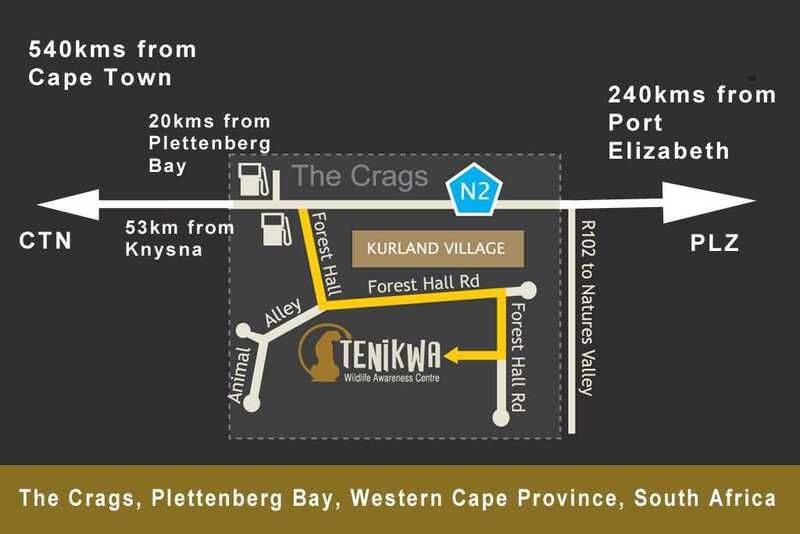 You will pass Kurland Village on the left hand side and the soccer fields on the right hand side. Drive approximately 2 hours from Port Elizabeth on the N2 National Highway, passing Humansdorp, Jeffreys Bay and Storms River in the direction of George/Cape Town. Continue along the N2 and drive through the N2 Toll. Approximately 20kms, once you have passed through the Toll, look out for the R102 to Natures Valley. You will pass Kurland Village on the left hand side and the soccer fields on the right hand side. Keep going. Take the N2 National Highway from Cape Town to George, and drive approximately 5 and a half hours on the N2 past Swellendam, MosselBay, George, Wilderness, Knysna, Plettenberg Bay. From Plettenberg Bay, follow the directions above. The closest airport is Plettenberg Bay Airport. Flights are operated by CemAir. Schedules and prices can be accessed at www.cemair.co.za. Please book car hire or transfer service before arrival. From Plettenberg Bay, you will need to drive to Tenikwa or arrange transport with a transfer service. George Airport is approximately 1.5 hours from Tenikwa. There are various airlines that service George Airport. Get an idea of schedules and prices at www.travelstart.co.za. There are also budget airlines that have good deals. See www.kulula.com and www.flymango.co.za. From George, you will need to hire a car or arrange transport with a transfer service. Port Elizabeth Airport is approximately 2.5 hours from Tenikwa. There are various airlines that service Port Elizabeth as it is the gateway to Addo and The Garden Route. Get an idea of schedules and prices at www.travelstart.co.za.There are also budget airlines that have good deals. See www.kulula.com and www.flymango.co.za. From Port Elizabeth, you will need to hire a car or arrange transport with a transfer service. Consider flying into Port Elizabeth, hiring a car and travelling down the scenic Garden Route, and then flying from George or Cape Town depending on your time restrictions. Have a look at www.addo2capetown.com for wonderful accommodation and activities along the way. Cape Town International Airport is approximately 6 hours from Tenikwa. Get an idea of schedules and prices at www.travelstart.co.za.There are also budget airlines that have good deals. See www.kulula.com and www.flymango.co.za. From Cape Town, you will need to hire a car or book a Garden Route tour with one of our recommended tour operators. Consider flying into Cape Town for a few days, hiring a car and travelling up the scenic Garden Route, visit one of our wonderful Big 5 Game Reserves at Addo and then flying out from Port Elizabeth. Have a look at www.addo2capetown.com for wonderful accommodation and activities along the way. Budget Travellers can also consider making use of the extensive and reliable Coach Companies that travel between Cape Town and Port Elizabeth, stopping off at Plettenberg Bay. From Plettenberg Bay, you will need to hire a car or arrange a transfer to Tenikwa with one of our recommended transfer companies. 33°57’39.92″S / 23°29’50.03″E and turn right to Tenikwa entrance.